Reality by Rach : Glee's Season Three Opener...Kinda Beat! The FOX hit show came back with a bang...or a beat rather! The show made it's return through the lens of Jason Ben Israel the schools gossip source. Just like last season's opener we find out what the Glee Club have been up to. I must admit that although it was fun last Season when the it lacked the punch of energy and fun it possessed last year. This time it just seemed to be a device to easily fix a lot of the flaws that existed last season and clear up some rumors/make fun of whose staying on and whose leaving the show. There tons of great storylines for this Season with Sue running for public office and threatening to cut all public arts programs putting her and Will even more at odds and at one another throats. This Season also has Will and Emma living together which comes a a big surprise since we never r really even saw them date. We also have Quinn returning to school as this bitchy badass outsider after her rough past couple of years of school which I'm not quite buying yet but kudos Glee for trying something new. Lastly, for those of you who have closely followed the show have been expecting, Blaine has left Dalton to join the rest of the Glee kids at McKinley. I liked him as a Warbler and he just seems too animated outside of his sports coat but maybe it'll just take some getting use to. The episode Purlple Piano Project revolved around the group being forced to perform any time they saw one of the purple piano's around campus that were donated from foreclosed homes. Yeah...kind of a silly concept but it was pretty fun. We got to see some great performances of "We Got the Beat" and a fun closing number of "Can't Stop the Beat." 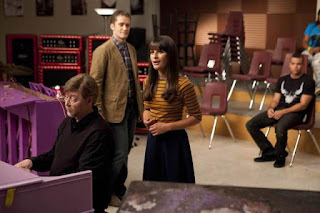 The best part of the episode however was the great connection between Rachel and Kurt who as of the end of last season have bonded over pursuing their dream to be on Broadway. Their situation is so relatable since we all a dream that we're trying to achieve. My favorite scene from the ep is when they go to scope out the competition in downtown Ohio and run into Harmony, played by the super talented Lindsay Pearce, one of the finalist from The Glee Project. The show followed the journey of a group of contestants trying to be on this Season of Glee and went behind the scenes of the auditioning process. Seeing how the rest of the winners from the show will be incorporated into the season will definitely make Glee fun to watch this Season. Unfortunately, this wasn't a great episode, I give it a C. However, although there are bad episodes of the show they are often trumped by the ones that are great and I look forward to those this Season cuz you can't stop the beat and you CAN'T stop this show!